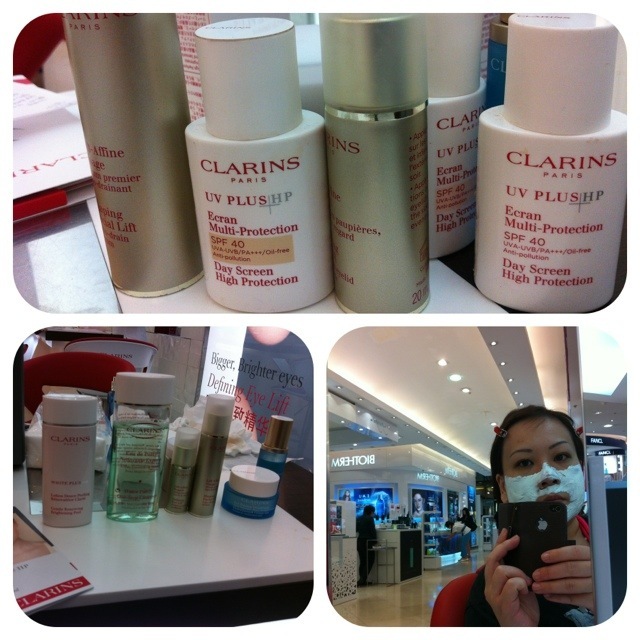 I’m raving about my CLARINS experience at the Raffles City Shopping Centre ROBINSONS today. I wasn’t really looking to buy anything but chanced upon CLARINS “Big Beautiful Eyes Pledge” on Facebook. By entering your particulars, you get invited to try some products out at your chosen CLARINS counter. I made my appointment at Raffles City because it was closest to work. This experience didn’t start really well. I’m sure it’s partly because of how I look and dressed. To be fair, I didn’t identify myself and waited for the consultant to serve another 2 women before stepping up. The first thing I asked was about a gorgeously pink lipstick, then I passed her the printout (which you were supposed to bring to prove that you LIKED their page and signed up for the challenge). After clarifying, she explained that she could do it on my hand (which would be faster and simpler) or remove my make-up and try the products out on my face. I chose to try it out on my face because I have time anyways. I spent close to 1 hour and 30 minutes having my make-up removed, then getting the various products slathered on my face – including a mask. This allowed me to feel the products on my skin and see how they’re being used. It was full-on slather and not a half-hearted affair. During the trial, I asked questions because I was genuinely interested in the products as she was offering them to me. I got the feeling that she was more enthusiastic after I showed more interest. She wasn’t pushy and explained how the products were used, even answering my questions about some similar products I was already using from competitors like Shiseido. Anyway, long story short, I bought the lipstick (Rouge Prodige 102), Water Purify One-Step Cleanser, HydraQuench Intensive Serum Bi-Phase and WHITE PLUS Whitening Velvet Emulsion with SPF20. I also received a full sized bottle of their Satin-Smooth Body Lotion with Sorbier Bud as well as a set of travel-sized skincare (toner, make-up remover, scrub etc) because they were having a promotion. 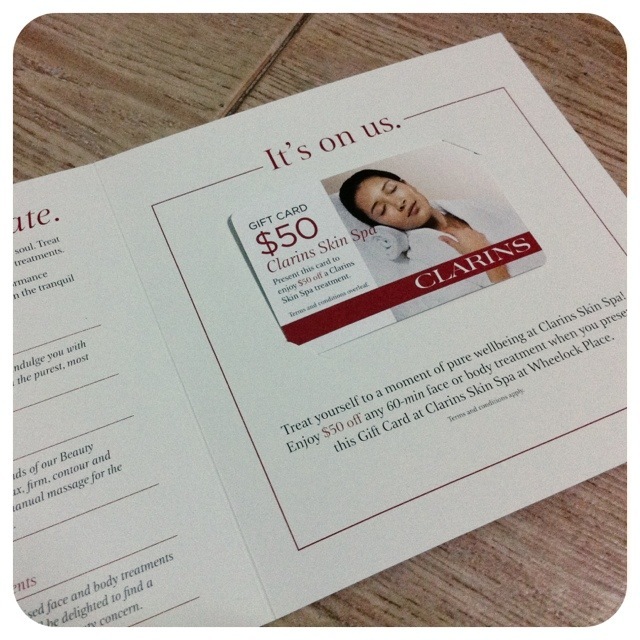 Also, I was given a $50-off voucher to the Wheelock Place Clarins Spa once I was automatically made a member. AND because I spent over a certain amount, ROBINSONS gave me a $20 voucher (which the cashier promptly used to deduct from the total cost). In the end, I spent only $259 on everything! I know it’s a little more spendy that I usually am (partly because I’m a bargain hunter and I am skint) but I think today’s haul is a fantastic deal! For those products that I was unsure of, I was given a suitable stash of samples to try. 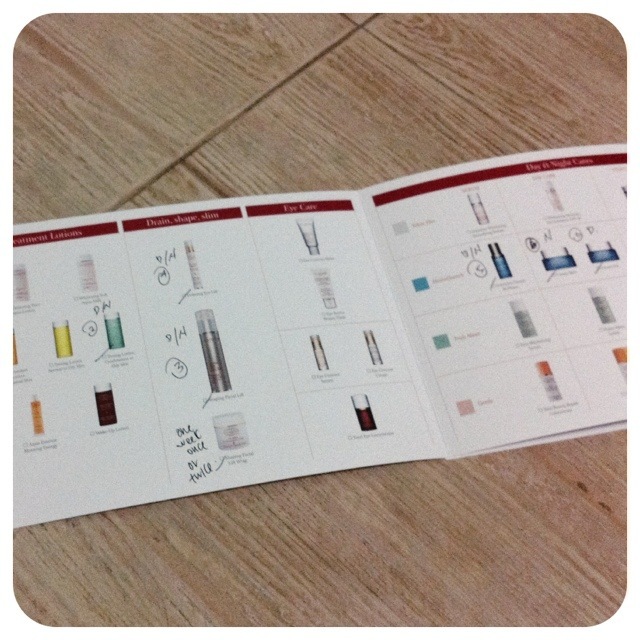 The consultant also indicated in a product guide, which ones to use, when (including the samples). I am impressed because this gives me an idea of what my entire skincare routine would entail and whether or not the extra products will benefit me. The beauty consultant that serviced me was Janice Han and I’m very happy with today’s CLARINS haul and experience (much better than what I can say for a certain SK-II counter where I was told I needed every product under the sun because I had really bad skin, then refused to give me more than 2 sample sachets to try out the products). I’m sure I lucked out with the triple-bonus and after today, I don’t think I’ll ever bring home that many CLARINS products for $259. But then again, if they work, I don’t think I’ll be that worried because I know that I can try out the products adequately before I plonk down the moolah. So does this count as a haul? Categories: Rants & Raves | Tags: beauty, beauty products, blogging, CLARINS, cosmetics, discounts, Freebies, hydraquench intensive serum bi-phase, iphone, lipstick, raffles city, rouge prodige, samples, satin smooth body lotion with sorbier bud, singapore, skincare, skincare samples, water purify one-step cleanser, white plus whitening velvet emulsion | Permalink. Are you going to join the spa?